The Remove operation allows you to remove a feature from an image, and then replace it with a colored region that is developed by examining the colors surrounding the area selection. For example, you could use this operation to remove a bird from the sky, or a ship from the ocean. The general rule for removal is that if the object is not attached to another object, it can be completely removed. If it is partially attached, the larger the area of interception between the object to be removed and the object it is attached to, the less successful the removal operation will be. Once the object has been selected, F/x will remove the object, and then fill that region with colors it generates by examining the background around the edge of the area selection. You can control the number of samples around the edge of the area selection by increasing or decreasing the Samples amount. Increasing the samples will increase the quality of the removal, but it will also increase the computational time needed to complete the operation. 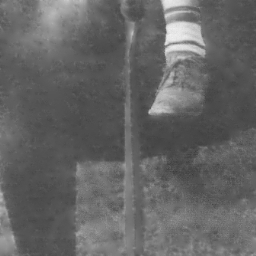 In this example, we use part of an image of a child riding a horse that has some extremely difficult problems. Not only does this section of the photograph contain torn surfaces, but it also is covered with "crazing" artifacts. You can see that the remove feature not only was able to remove the tears, it did not pick up the crazing and introduce it into the repairs, even though the crazing does intercept the edge of the areas we worked on - the shoe and the major rips. Finally, with considerable attention to detail, the image has been significantly improved using Remove. Each crazing instance was carefully outlined and eliminated using Remove. In the course of this series of operations, some of the grass texture underneath the horse was lost, which we then re-built using a clip of the grass where the texture remained, and the Apply Canvas operator. This operation is well suited for use with any area manual area select; it won't work with Entire Image. the idea is simply to surround the pixels to be removed. The Samples control is used to specify the number of points that the remove feature will draw color from. The number of samples specified relates directly to the quality of the remove feature. Increasing the samples will also increase the computational time needed to complete the operation. The sample can range between 0 (no effect) to 50 (maximum number of samples). The sample will draw color from the edge of the area select towards a central location to effectively "remove" the object specified by the area selection. This option can be set with the slide gadget, or by entering the value in the provided text entry field.